Thread: Can anyone tell me how old these fabrics might be, please? I bought a sewing box that had buttons, thread, old measuring tapes, etc.. in it it has 2 clear trays in the top then a big open area in the bottom. In the bottom, there was a package of dressmaker's tracing paper, a large envelope with design transfers and some fabric squares and some blocks already hand sewn together. I'm gonna try to piece the rest together and I was just wondering how old the fabrics are I've not ever seen a lot of them. Also do you think it would take away from it if I had to add some of my newer fabrics to finish some of the blocks? Anyway here are the pictures I took. They look like 70's and 80's to me. But, I really have no idea. Polka dots, stripes, plaids and solids (unless they are an unusual color) are hard to date, because those have been around forever. The 4 patch with the solid brown squares and dotted squares of brown and red (?) looks 1920ish to me. In the second photo, the red fabric with the lady's face is older, I think--maybe late 1800's (?). I have a question: Is the navy blue color (on the pieces of navy blue fabric) just as dark on the reverse as it is on the front? If so, then it is a vat dyed fabric, and probably dates to the 1800's. My guess is these blocks are made from fabrics dating around the turn of the century, some before and some a few years after. I would NOT use modern fabrics to enlarge this top, with the exception of same-period reproductions. Stay true to the time period, imho. They do not look like 'antique' (ie 20s or 30s) fabrics, so I don't see any reason not to combine them with current ones. I've used fabrics of similar age without any problems. The only one I had problems with from the 70s/80s era or slightly older was some corduroy that had gotten dry rot from being stored in a basement for several years. I'm currently collecting fabrics to mix with some 60s/70s bright aqua, hot pink, knock out orange prints for a retro quilt. yes, the navy blue is the same dark shade on front and back. If I don't use any of my fabrics what would you suggest for the backing then? My oldest daughter ( age 12) would love to have me make her a quilt like that! She's been asking for a quilt in really bright colors some time! Well then those navy fabrics are indigoes, and they probably date to the 1800's. Do you see the fabric at the top of the first photo which looks like a gradated dark to light red, paired in the 4 patch with a solid salmon (?) color? That looks to me like an "ombre", and if so, it dates to the 1800's. Computer monitors sometimes show colors inaccurately, so it's hard to be sure, but some of the solid pinks you have may be "bubble gum" pinks from the 1930's. 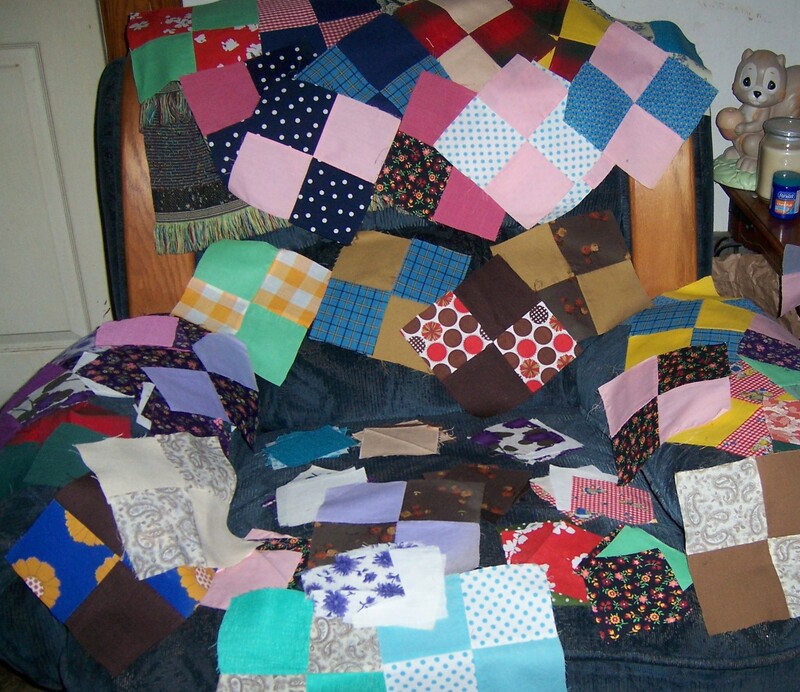 Even then some quilters had stashes and quilts were often done with fabrics ranging over quite a number of years. Sometimes that happened when one family member started the quilt, then a daughter/niece or someone else finished it, many years later. As for the backing, you could use a reproduction fabric from around the turn of the century, or you could just use a good quality muslin. Muslin has been used for quilts for forever, so that would be true to the time frame, too. I have a 1930's Trip Around the World quilt top I bought on eBay which I am enlarging with reproduction fabrics. On the back I will include a legend stating where the original fabrics are and where the reproductions begin. If you are interested in learning more about vintage fabrics, the first book I would recommend is Eileen Trestain's Fabric Dating. There are two of them: one with photos and descriptions of really old fabrics, and in the second book the fabrics are more recent. Your fabrics would fall into the first book of hers. Have fun on your new journey! Let me know if I can be of any further help. Not much earlier IMO! Based mostly on the brown and coral dots. I really think they look alot like the fabrics for the 70's and 80's. Made a lot of cloths for may daughter during those years and remember alot of fabrics which really look like those! - most often used on pillow cases. I agree with Deb...later 70's and 80's...but...I think some of those ginghams may be poly/cotton. I believe they are from the 70's-80's or so....some of them look like poly to me, too...good luck! My opiniion would be late 60's to present day. looked at my books on fabric and your are correct that most of these are from 40'-70's. There are NO Indigo or Turkey reds or even real shirtings in the pix you have posted here. having said that, once you put these into a quilt, the quilt is then dated by the date that you complete it! Meaning a quilt is only as old as the last fabric put into it! I am older than dirt and have been sewing since the 1940's and this looks like a bunch of sewing scraps, big variety of stuff. There is even a piece of that old fabric with a crinkle design pressed into it. (tourquoise, at bottom of one picture). There were a lot of yarn dyed plain fabrics around, same on both sides and no white on the threads when ravelled. Looks like you can make a cute scrappy quilt, but I don't think anything will pass for true vintage. Have fun with it! I think they look like late 70's or early 80's. I recognize the red chambray and blue striped and big gingham from when I worked in a fabric store during that time period. That's what I thought. I also had some dressmaker's transfer paper and embroidery patterns when I was younger--found them at a yard sale! Hi Sewred, I honestly don't think any of these fabrics are more than 10 yrs old. I have several of these and they were purchased in the clearance from Joann's. The polka dots and large checks can still be found in some of the Joann's stores. The red chambray is still carried by Joann's as a seasonal item. The red ombre is similar to one sold from Crate & Barrel/home dec fabric. I also believe them to be from the 70s. am not sure about the 80s cant remember much of that decade. I agree with those who think 60's-80's. They sure look like fabric I used during those years for dresses for my girls. I would not hesitate to use newer fabrics with them. I once had one of your fabrics, and it was bought in the late 70's. While a lot of your fabrics appear to be from the 70's and 80's, some are probably earlier fabrics. Since there is such a wide assortment of fabric designs then you can add to it without effecting the look. If you want to be more accurate and don't have the stash, then look in antique shops for fabric. Very often the booths will have rolls of fabric left from dressmaking. It appears to be left from dressmaking or other clothing. I would date the overall look to probably in the 1950" even there might be fabric from prior years. I agree...I have lots of vintage fabric and these fabrics are not that old. I'd also say 70's to 80's. Go ahead and add to it from your stash.